The thing about ring attack TASes is, in a traditional TAS, the idea is to go from beginning to end of a level or game as quickly as possible - but, in a ring attack, it is to go from one ring or set of rings to the next, in such a way that results in the overall level or game completion with the most rings in the shortest time. Hopefully that gives some perspective on the extraordinary amount of work that ring attack TASes require. And not to diminish other forms of TASes, which already in their own right require tremendous effort and expertise. It was in fact one such TAS - a traditional Sonic TAS, by SprintGod - which caught my eye in 2012. This was my introduction to TASes as a thing, and it blew my mind and inspired me to get into the TASing scene. Around that time, new discoveries by the likes of MarzoJr, Nitsuja, Aglar, and others, of game-breaking bugs were resulting in Sonic 3 & Knuckles TASes that were faster and more impressive than ever before. However, there was a growing concensus within the community that such runs, for all their glory, deprived the viewer of the kind of intensive gameplay that makes TASes so attractive in the first place - for which Sonic games of old are ideal, by their fast-paced nature. Yet, there seemed to be no solution to this dilemma given TASvideos' rightfully strict guidelines governing submissions. And yet again, in spite of this, in 2013 I began work on my own personal vision of what that solution could look like. And hence in 2014 I submitted my Knuckles ring attack TAS of S3K. It was well-received, luckily, and I said then that I hoped that one day a TAS just exactly like this one might eventually emerge. And it's all thanks to the enterprising Evil_3D, who founded the project, and his inventive co-author Kaan55, who joined some time later, after offering several new strategies to get even more rings; whereas my own participation was primarily planning-related. I would like to think that my TAS had the same impact on Evil_3D and Kaan55 as SprintGod's had on me. It was a pleasure working with them and getting to know them, albeit in the limited capacity that I did. I hope that you the viewer, find as much enjoyment as I do in watching this run, and as I and others on the forums did, in watching its development. Sonic Zone 0: This site contains very useful informations about classic Sonic games, it was used as the main fount of information of the levels and did the route planning process less tedious. Ice Cap 2 time is 0:55'15 "igt" + 7346 real time frames. We calculated the in-game time from the start of the level to the frame we beat the Act 2 boss like the game normally would've done. What rings didn't we get? 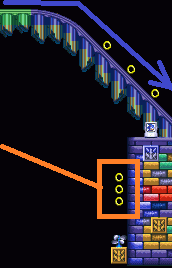 42 rings on Angel Island 2 Knuckles area due for the limitations of the death boundary, make them impossible to collect. 1 mutually exclusive signpost ring monitor (10) on Launch Base 1 Knuckles boss area. There is currently no known ways for Sonic and Tails to get any of these. 21 months, the run suffered a lot of resynching progress and we redo it from scratch most of the levels due to newer glitches and updating the inputs to a more optimized version. Why the movie starts from a savestate? The movie starts in a savestate with all emeralds/super emeralds to allow the giant rings collection and unlock the final zone, which contains more rings. Sonic can use the elemental shields abilities. Sonic/Tails history has more levels and unlock other zones: Lava Reef 2 boss, Hidden Palace, Sky Sanctuary and Death Egg. Sonic along with Tails can do amazing combos, like carrying Sonic, and Tails can grab rings off-screen as long as Sonic's camera and Tails are in the same position vertically. Tails can save a lot of time collecting out of the way rings, avoiding annoying backtracking. Tails immortality/respawn is essential in some levels for collect more rings, the most notable use of this is Angel Island 2. And of course, there is already an existing movie of Knuckles wich this run was inspired for. Frame 1200/0:00'00 : The level starts with generating Tails and carrying Sonic when I still do not have control, and I keep Knuckles on the screen as long as possible to prevent the in-game time from starting earlier. Frame 1960/0:04'00 : You can see that the monitors screens are glitched, but here I collected a ring monitor and speedshoes, the speedshoes are useful to travel the level more faster until the first giant ring. Frame 2480/0:12'40 : Tails grab 3 rings off screen, at frame 2560/0:14'00 : you can see him grabbing 3 floating ring on the left side. Frame 2760/0:17'20 : Tails grab a group of 7 floating rings. Frame 2850/0:18'50 : This is a ring monitor. Frame 3520/0:30'00 : Using the loop zip and using Tails to grab the 3 ring on the tiny lake this saves a lot of time. Frame 3875/0:35'55 : This secret room has 3 monitors, 2 rings and 1 invulnerability. Frame 4125/0:40'05 : This new loop zip was discovered by WST which allows me to skip having to run around in the hollow tree, and thanks to Tails we're also able to grab the 5 rings on the right while doing the zip. Frame 5168/0:57'00 : Tails supports Sonic breaking this platform so that Sonic falls directly down and proceeds to the next giant ring room, same situation on frame 5673/1:05'13. Frame 5475/1:02'05 : In the upper right part of the screen you can see Tails picking up a group of 3 rings. Frame 6155/1:13'12 to 7163/1:29'42 : Here is where the lightning shield comes into action, this part normally without this shield would be very tedious to do since the rings are in very uniform positions, but thanks to his ability to attract this section is easily overcome. Frame 6957/1:26'17 : Tails grabs 2 rings above Sonic and then the last group of 3 at frame 7165/1:29'43. Frame 7393/1:33'29 : The boss receive perfect frame hits without the need of the insta-shield. Frame 8995/0:02'36 : By jumping at the right spot Tails is able to clip through the ground using the breakable rock. 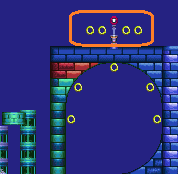 This allows him to go into Knuckles' area to grab some rings. This was also done in a few more areas. 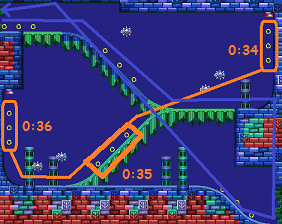 Frame 9088/0:04'09 : For some reason the Act transition raises the death boundary a little which prevents Tails from being able to grab the rings in Knuckles' area. I have to go past a certain point to lower it back down. I purposefully get stopped as soon as I can in order to get sent back quickly. 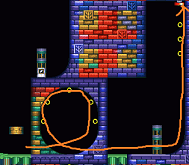 This level is relatively played normal, however the most important things here to explain are Tails ring grabs. Frame 25645/0:03'40 : Tails collects 10 floating rings off-screen here. SID': For the amazing artwork! Everyone who followed the project from its roots via forum thread/youtube and observing its growth and offering his support in these 2 years, I want to say thank you. Submission text is still on development, be patient. feos: Let's get crushed with the rings and judge this.